The Russian government says it will invest 80 billion US dollars in developing Russia’s Far North between now and 2030, money it does not yet have (profile.ru/economics/item/111568-5-trillionov). But the biggest barrier to achieving its goals may not be financial stringencies but the impact of global warming. 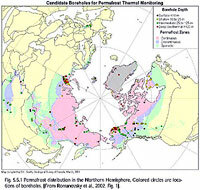 According to Russian experts, permafrost unlies almost two-thirds of Russia’s territory. It is melting rapidly already. Twenty-five percent is projected to melt over the next 40 to 50 years and by 2100, a total of two-thirds, creating enormous problems for Moscow and Russia as a whole (svpressa.ru/society/article/158491/). Already, melting has undermined almost all the buildings of the Taymyr autonomous district and almost 40 percent of the structures in Vorkuta and its mining industry. It has undermined the transportation network and pipelines. And it has led to outbreaks of disease not seen since World War II. But as bad as the situation is now, it is going to get much worse; and yesterday, scholars and officials met in Moscow to discuss the problems of predicting the kinds of emergencies that may emerge in the Far North as a result of the melting of the permafrost and what if anything Moscow can do now to limit them. Leonty Byzov of the Moscow Institute of Sociology notes that “eternal” permafrost now covers approximately 11 million square kilometers or almost 65 percent of Russia’s territory. But the area is home to only a few percent of Russia’s population, although there are some urban centers like Norilsk. Experts divide depending on how effective they think any steps can be and how much they believe Russia’s national security requires developing the area regardless of cost. Many think, Byzov says, that warming will make the lives of those living there easier. “But in fact, it is obvious that warming in the North creates more problems” than elsewhere. The only reason more people aren’t leaving the area now, he continues, is that “all who could leave already did so in the 1990s.” Those who remain either have nowhere to go or have resigned themselves to living in ever more difficult circumstances. According to Byzov, many exaggerate the possibility that China will move into the region. Beyond doubt, China will be exerting a greater influence than now along the route of the Trans-Siberian railway in the south; but it is unlikely to be interested in making the investments that would be required to become a major player in Russia’s Far North. What Russia should have done 20 years ago or more is what Canada has done and transform much of the high north into national parks and preserves. But Moscow missed that chance and now it is too late in many cases. The result: widespread fires that often burn out of control for weeks or more. Nikolay Rybakov, an ecologist, pointed out that as the permafrost melts, there is an even greater danger than many now think. In Soviet times, the military buried all kinds of dangerous materials in permafrost areas confident that what they put in the ground would stay there. But that calculation was wrong, and now many things are coming to the surface. Tragically, much of this was done secretly and so Russians today do not even know just where and just what is buried. If they find out only after these things rise to the surface and spread their poisons, that will have horrific consequences not only for the region but for Russia and all countries with territories in the Far North.